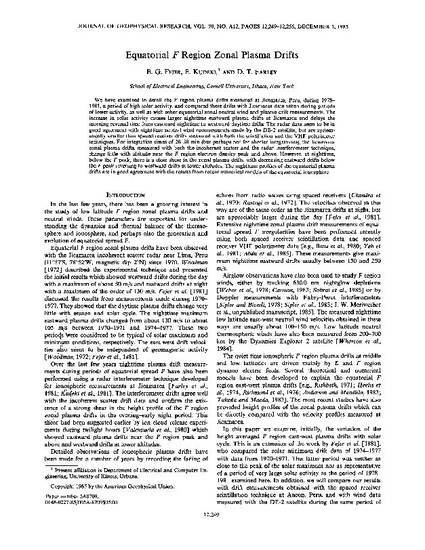 We have examined in detail the F region plasma drifts measured at Jicamarca, Peru, during 1978–1981, a period of high solar activity, and compared these drifts with Jicamarca data taken during periods of lower activity, as well as with other equatorial zonal neutral wind and plasma drift measurements. The increase in solar activity causes larger nighttime eastward plasma drifts at Jicamarca and delays the morning reversal time from eastward nighttime to westward daytime drifts. The radar data seem to be in good agreement with nighttime neutral wind measurements made by the DE-2 satellite, but are systematically smaller than spaced receiver drifts measured with both the scintillation and the VHF polarimeter techniques. For integration times of 20–30 min (but perhaps not for shorter integrations), the Jicamarca zonal plasma drifts, measured with both the incoherent scatter and the radar interferometer technique, change little with altitude near the F region electron density peak and above. However, at nighttime, below the F peak, there is a clear shear in the zonal plasma drifts, with decreasing eastward drifts below the F peak reversing to westward drifts at lower altitudes. The nighttime profiles of the equatorial plasma drifts are in good agreement with the results from recent numerical models of the equatorial ionosphere. Fejer, B. G., E. Kudeki, and D. T. Farley, Equatorial F-region zonal plasma drifts, J. Geophys. Res., 90, 12249, 1985.